We’ve written here before about how divorce affects your NYSLRS pension, what a DRO is and why it’s required. However, NYSLRS members have other benefits besides their pensions. Divorce and DROs may affect some of them as well. As with your pension, a DRO may direct you to designate your ex-spouse as a beneficiary for some portion of your ordinary death benefit. You should file the DRO with NYSLRS as soon as it’s officially accepted by the court. 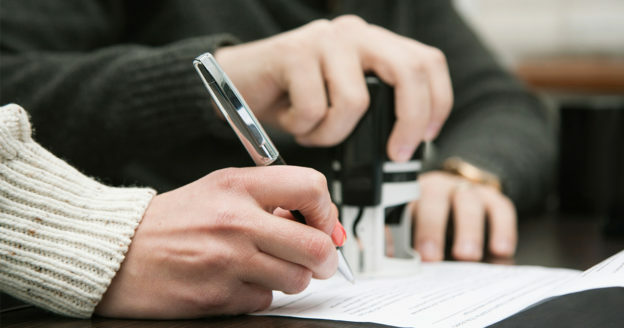 We will prepare a custom beneficiary form that complies with the DRO. Also be sure to choose additional beneficiaries for any remainder of the benefit and submit your changes to NYSLRS. Most Tier 2, 3, 4 or 5 members of the Employees Retirement System (ERS) are covered by a post-retirement ordinary death benefit. A DRO may direct you to designate your ex-spouse as a beneficiary for some portion of the benefit. 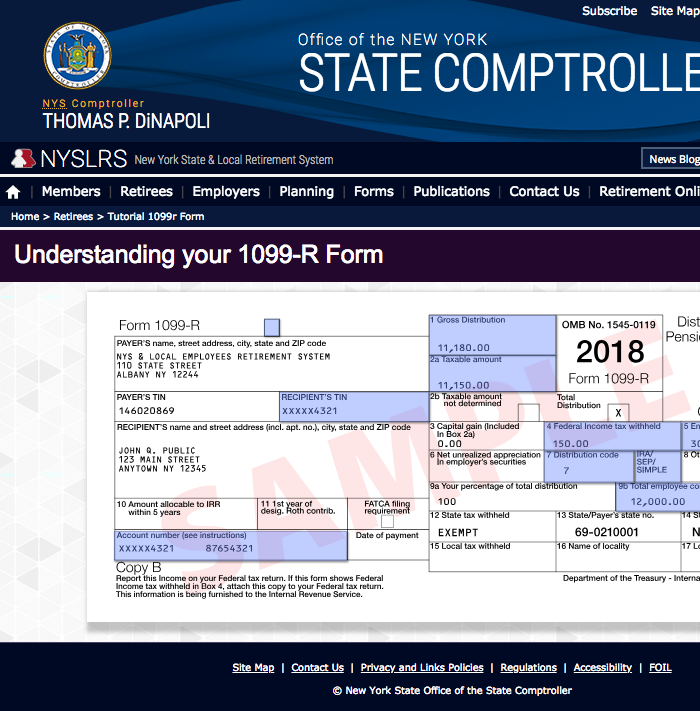 You should file the DRO with NYSLRS as soon as it’s officially accepted by the court. Be sure to contact us to choose additional beneficiaries as allowed by the DRO. 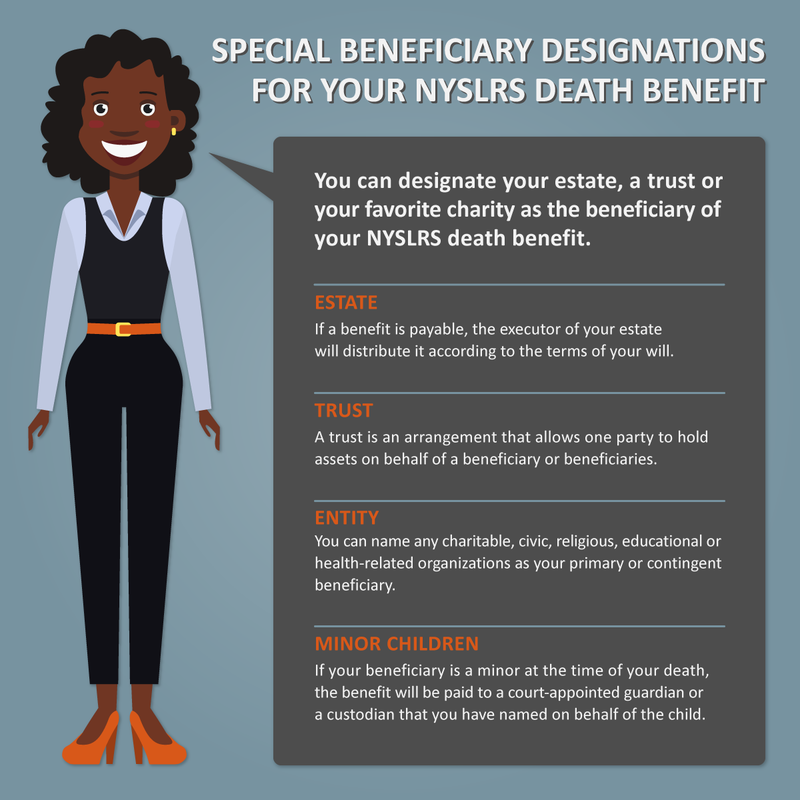 NYSLRS members who meet eligibility requirements can borrow a certain percentage of their contribution balance. DROs may be written to prohibit members from taking future loans. Outstanding loan balances at retirement reduce retirees’ pension benefits. Unless a DRO specifically provides that the ex-spouse’s share of the pension be calculated without reference to outstanding loans, the ex-spouse’s portion will also be reduced if a NYSLRS loan is not paid off before retirement. Occasionally, NYSLRS may refund a member’s contributions because of a tier reinstatement, membership withdrawal, membership transfer or excess contributions. If the member is divorced and NYSLRS has a DRO on file, the DRO will determine whether a portion of the refund must go to the ex-spouse. Generally, if the DRO doesn’t mention a contributions refund, the member receives the full amount. A divorce, annulment or judicial separation removes a member’s former spouse as beneficiary of certain death benefits and retirement options, except as provided by the divorce judgment or decree, or a DRO. So, if you have gone through a divorce, annulment or judicial separation and you do NOT have a DRO, you must resubmit your beneficiary designation to NYSLRS to retain your former spouse as a beneficiary. 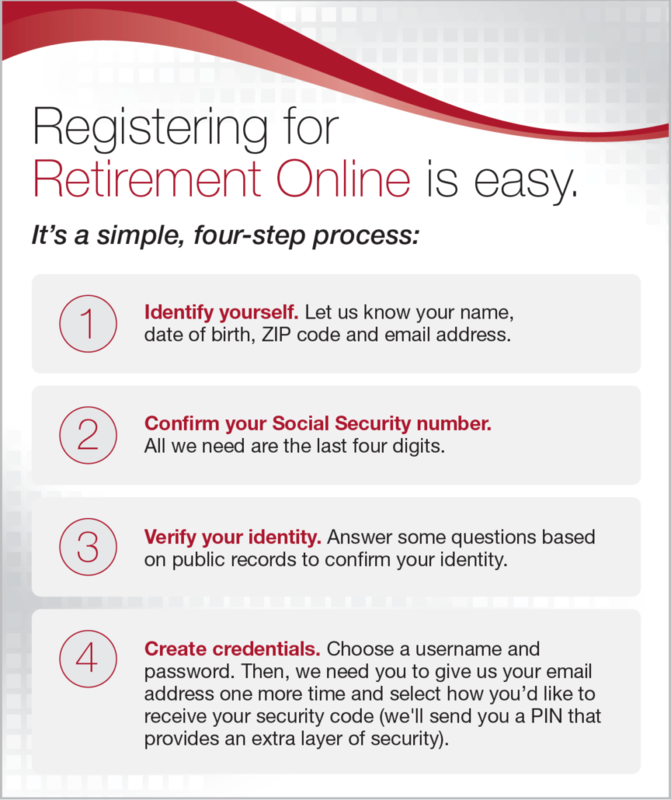 The easiest way to do this is by using Retirement Online, our secure, self-service web application. 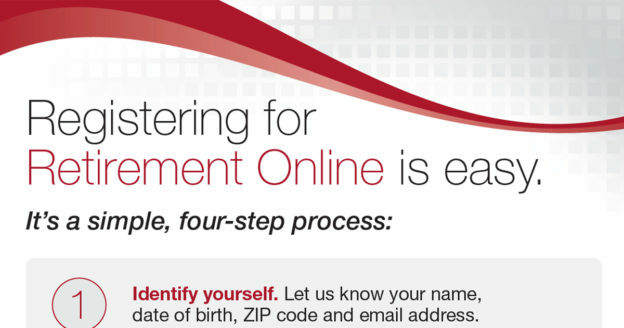 You can also submit a Designation of Beneficiary form. Content last revised January 16, 2019. This entry was posted in General News, Members and tagged annulment, beneficiaries, benefits, Death Benefits, Divorce, DRO, ex-spouse, former spouse, know your benefits, Loans, members, New York State & Local Retirement System, NYLSRS Pension, NYSLRS, ordinary death benefit, pension, Post-retirement Ordinary Death benefit, refunds, separation on January 16, 2019 by NYSLRS. Content last revised February 14, 2018. 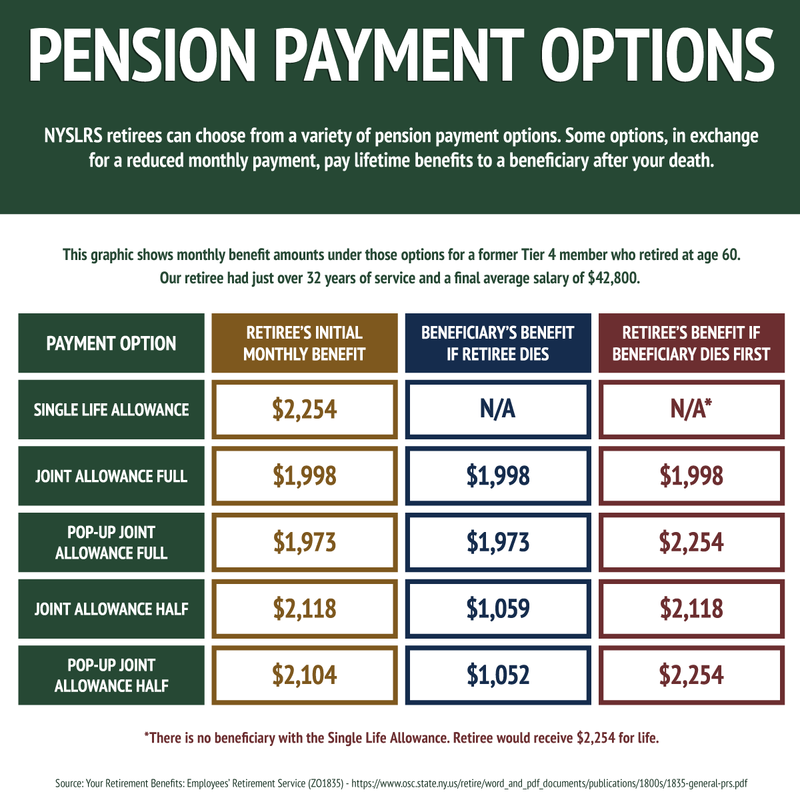 This entry was posted in General News, Members, NYSLRS Retirees, Retirees and tagged beneficiaries, contingent beneficiaries, designate beneficiary, ERS, Information is the Key, members, New York State & Local Retirement System, NYSLRS, PFRS, primary beneficiaries, retirement, Retirement Online, retirement planning on February 14, 2018 by NYSLRS. Where in New York are NYSLRS Retirees? 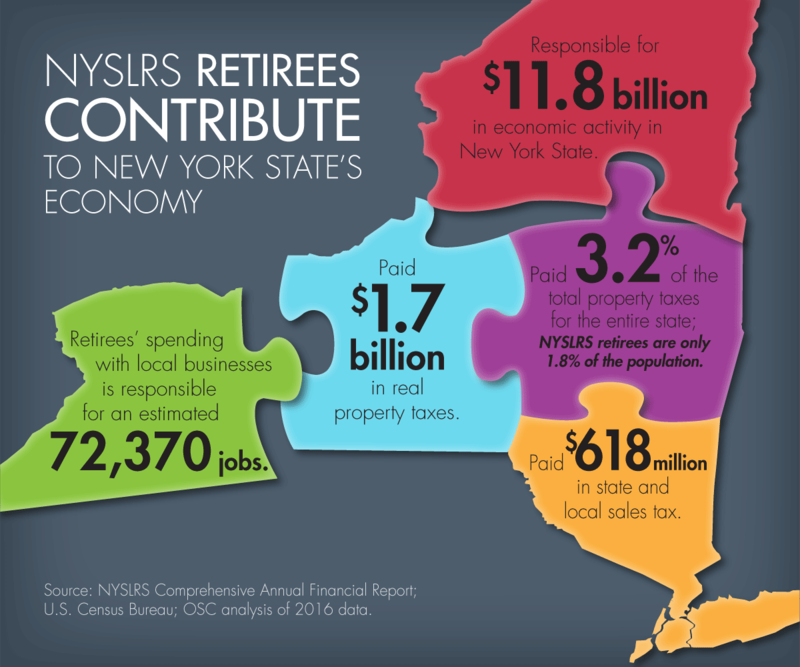 NYSLRS retirees tend to stay in New York, where their pensions are exempt from State and local income taxes. In fact, 78 percent of NYSLRS 452,455 retirees and beneficiaries lived in the State as of March 31, 2017. And half of them lived in just ten of New York’s 62 counties. So where in New York do these retirees call home? Well, there are a lot of NYSLRS retirees and beneficiaries on Long Island. Suffolk and Nassau counties are home to more than 57,000 recipients of NYSLRS retirement benefits, with annual pension payments exceeding $1.8 billion. But that shouldn’t be surprising. Suffolk and Nassau counties are, respectively, the largest and third largest counties in the State outside of New York City. Erie County, which includes Buffalo, ranks No. 2 in the number of NYSLRS retirees, with nearly 30,000. Albany County, home to the State Capital, ranks fourth with more than 18,000. Monroe, Westchester, Onondaga, Saratoga, Dutchess and Orange counties round out the Top Ten. All told, NYSLRS retirees received $5 billion in retirement benefits in the Top Ten counties, and $9.1 billion statewide. 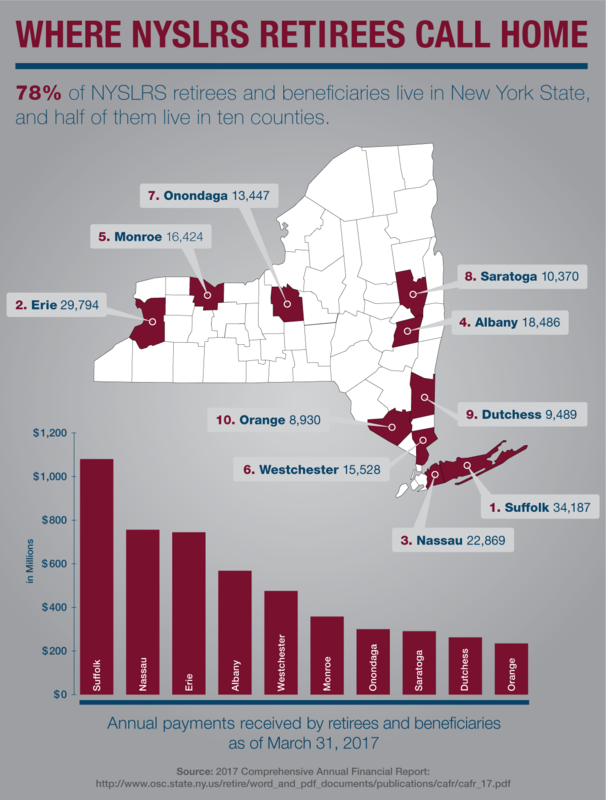 Hamilton County had the fewest NYSLRS benefit recipients. But in this sparsely populated county in the heart of the Adirondacks, those 435 retirees represent nearly 10 percent of the county population. $8.6 million in retirement benefits were paid to NYSLRS retirees in Hamilton County during fiscal year 2016-2017. Outside of New York, Florida remained the top choice for NYSLRS retirees, with more than 36,000 benefit recipients. North Carolina (8,693), New Jersey (7,466) and South Carolina (5,620) were also popular. There were 690 NYSLRS recipients living outside the United States as of March 31, 2017. Content last revised November 1, 2017. This entry was posted in General News, Retirees and tagged beneficiaries, Economic Impact of Retirees, ERS, Information is the Key, local tax, members, New York State & Local Retirement System, NYSLRS, NYSLRS Retirees, PFRS, Retirees, Retirees Contribute, Retirees Create Jobs, retirement, retirement benefits, state tax, Strong New York on November 1, 2017 by NYSLRS. We’ve written a lot about preparing for retirement — how you should purchase any credit for past service, get a pension estimate, prepare a retirement budget, and more. But, what about after you retire? 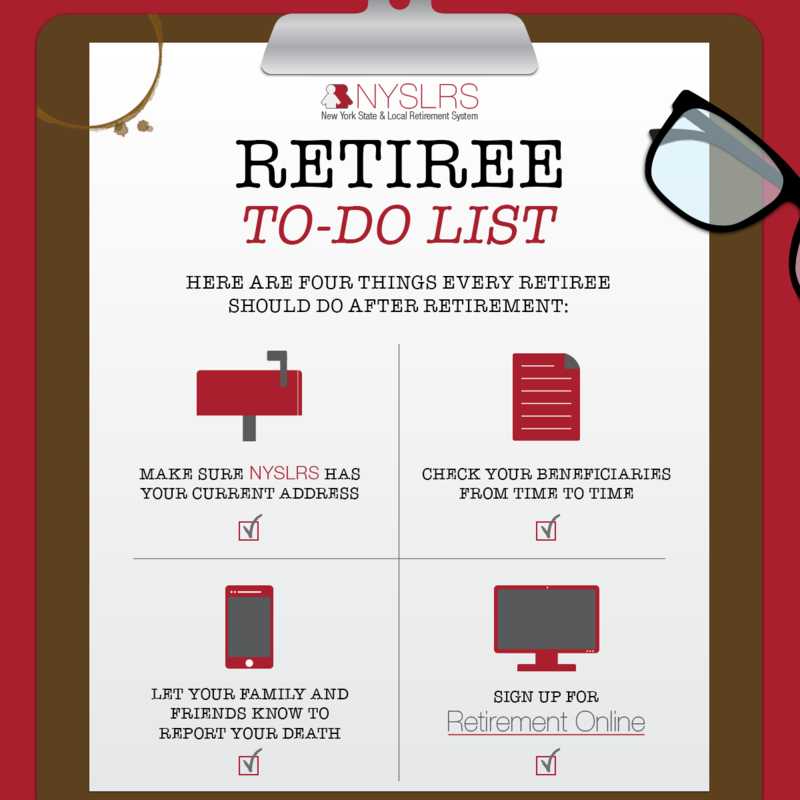 Are you finished with your NYSLRS To-Do List once you’re a retiree? 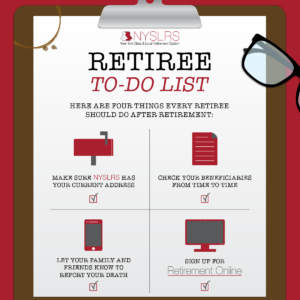 We recently launched the new Retirement Online, a secure site that allows you to check important NYSLRS information, like the deductions from your latest payment and a summary of your benefits. You can also view or update beneficiaries and generate income verification letters right from your computer. 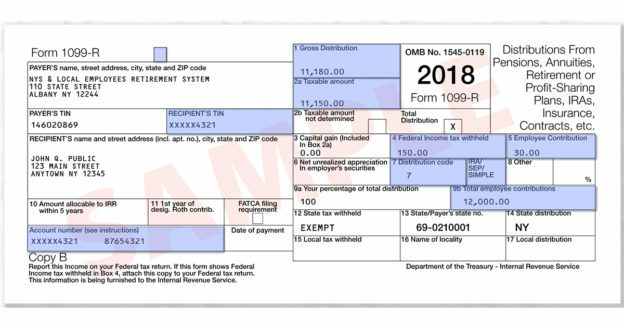 Your 1099-R form. Your pension isn’t taxed by New York State, but it is subject to federal income tax. Your Retiree Annual Statement. 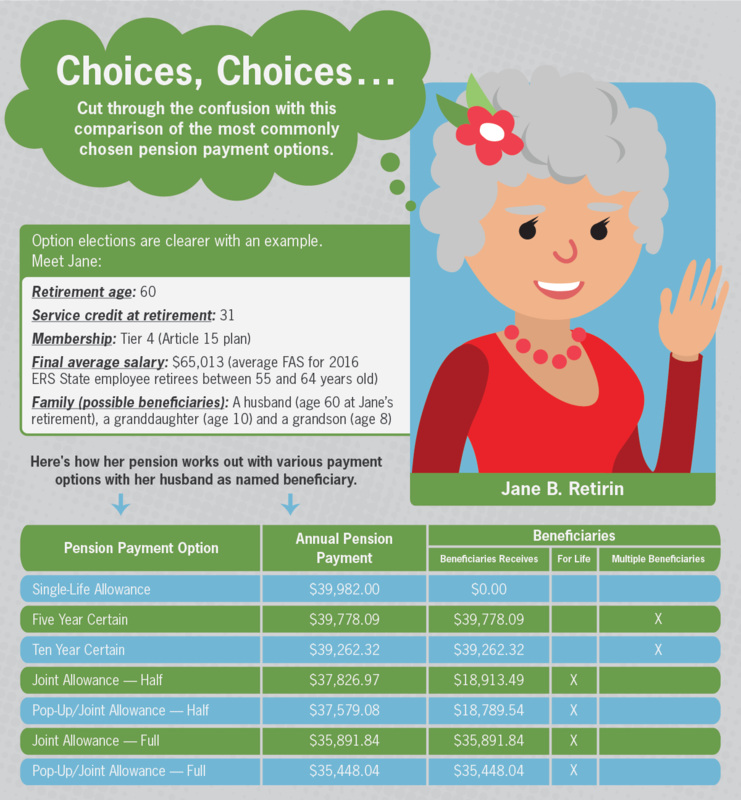 It’s a helpful reference that spells out the benefits, credits and deductions you receive each year. 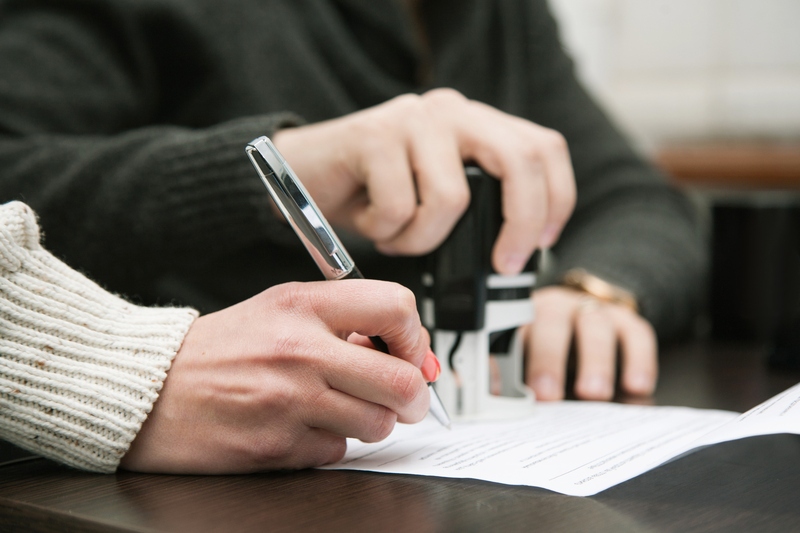 Reviewing your beneficiary designations periodically is important. By keeping them up to date, you ensure that any post-retirement death benefit will be distributed to your loved ones according to your wishes. You can use Retirement Online to change your death benefit beneficiaries at any time. Or, contact our Call Center, and we will send you the necessary form. 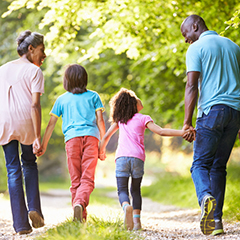 If you aren’t retired yet, submit a Designation of Beneficiary form (RS5127). Your family or friends have to know to notify us when you die, so we can pay out any benefits to your designated beneficiaries. They can phone our Call Center or notify us by mail. Either way, we will also need a certified copy of your death certificate. You and your loved ones can find more information in our Getting Your Affairs in Order and a Guide for Survivors (VO1874) publication. 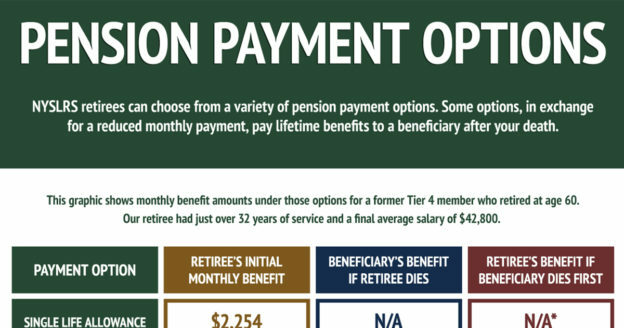 Check out this publication for information about other benefits you may be entitled to and the services we offer retirees. 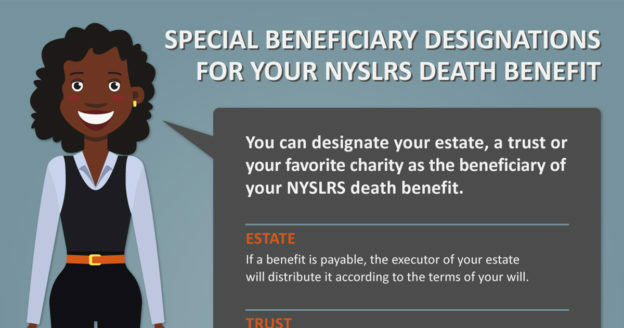 This entry was posted in General News, NYSLRS Retirees, Retirees and tagged beneficiaries, Information is the Key, know your benefits, Life Changes, New York State & Local Retirement System, NYSLRS, NYSLRS Retirees, retirement, Retirement Online, retirement plan, retirement planning, retirement security on August 23, 2017 by NYSLRS.